If you ask me, New York City is the college town. Though, I am a bit partial. I am a senior at Barnard College of Columbia University, located in the Morningside Heights (north of the Upper West Side, south of Harlem) neighborhood of Manhattan. For my friends and me here, the world is literally at our fingertips. On any given night, we can choose whether we want to catch a Broadway show (with student-rate tickets! ), stroll through one of dozens of museums, peruse the streets while shopping and, of course, eat at one of literally thousands of restaurants of every single ethnicity, history, flavor, and price-point in the city. There is something for everyone in New York, and with that comes a myriad of choices: Yes, I want Italian tonight, but which of the 26 Italian restaurants in a 10-block radius from my apartment should I go to? That’s the kind of food problem we face here in the Big Apple. Given the sheer enormity of New York City and the impossibility of giving this fabulous city its due praise in one single tour, I’ll focus on Upper Manhattan, above 59th Street. So, hop on an uptown train, and experience New York City from a Barnard girl’s perspective. Though a self-proclaimed City Girl, I often find myself missing the sight of real trees – not just those scrawny ones cemented into sidewalks – and bodies of water in New York City. Lucky for me, Riverside Park has unparalleled views of both with a jogger-friendly path stretching the western length of Manhattan along the shores of the Hudson River. As you sprint (or leisurely stroll) through the park, you can’t help but notice river taxis, ferries and sailboats on the river and New Jersey just on the other side of it. Must see: The pier near West 71st Street that jets off from the running path some several hundred yards into the water. Turn around, look up and take in the city lights from afar. A wide-open expanse of bright green grass, Sheep Meadow is a go-to study (read: tanning) spot in the city. Just a short walk from Central Park West near 66th Street, this fenced-in lawn is often laden with children, personal trainers and their clients, tourists and picnickers. Watch out for those footballs and Frisbees! A five floor monstrosity showcasing everything that has ever lived on this Earth or occupied infinite space around it, the American Museum of Natural History is an anthropologist’s, biologist’s, historian’s, sociologist’s dream museum. Larger-than-life elephant, whale and dinosaur replicas tower above patrons, while perfect stagings of past civilizations bring to life early Man. The exhibits are laid out in an approachable, easy-to-navigate space that is perfect for museum rookies and frequent visitors alike. Must see: Any of the Special Exhibitions. Though there is an added admission fee for these exhibits, they are often interactive (The Butterfly Conservatory, anyone?) or movie-based showings and are an ideal way to connect with one specific part of the enormous museum. Like its name suggests, this DIY fro-yo bar features 16 handles of tempting frozen flavors. Try a bit of each, or opt for a cup or cone of just one kind, then head over to the toppings buffet, and add anything from fresh fruit, cookie dough, candy pieces or sprinkles. With colorful outdoor seating lining the exterior of the building, 16 Handles on the Upper West Side is an after-dinner sweet spot. Be careful with those toppings though; 16 Handles charges by weight. Must try: A fro-yo trio of Red Velvet Cake, NY Cheesecake and Cake Batter flavors topped with brownie pieces and cookie dough, if you’re feeling indulgent. For something more refreshing, try Mango and Plain fro-yo flavors topped with fresh strawberries. 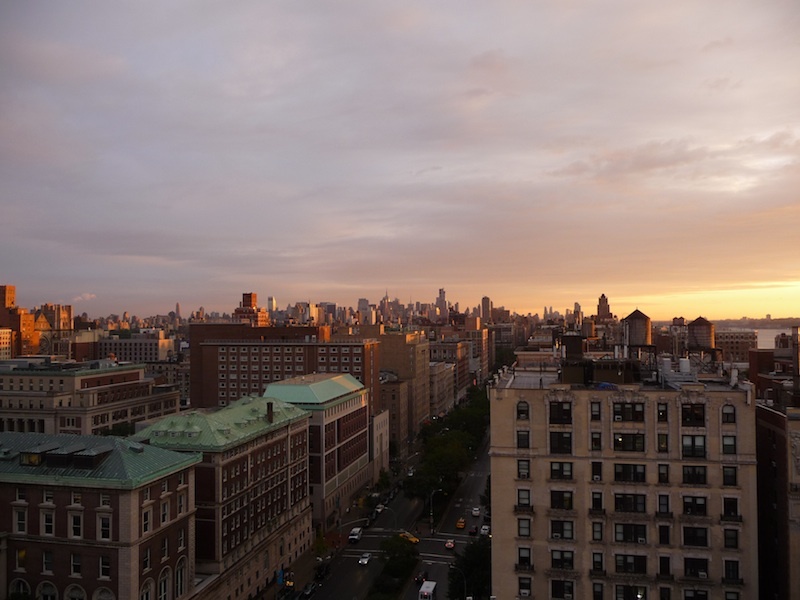 High above upper Broadway (okay, just one floor above), The Heights is a Barnard/Columbia institution. Famous for their jam-packed burritos, guacamole, and flavored frozen margaritas, this quaint and cozy bar features two Happy Hours every night (3-7pm and 11pm-close) and open-air, rooftop seating during the warm summer months. Must try: Frozen. Lime. Margaritas. Just do it. Trust me. At $8 during normal hours and $4 during Happy Hours, these frosty treats are frighteningly refreshing and hardly filling, so you’ll easily have room for two. Order the Chicken Breast Burrito with the “works” – rice, beans, cheese, salsa, guacamole, sour cream and chipotle sauce. Ahh Korean barbecue, the most flavor-packed barbecue to come off of four wheels. Serving up beef, pork, chicken and veggie burritos, tacos and bowls to hungry students, businessmen and tourists alike, Korilla BBQ is a fan-friendly truck that services various neighborhoods of Manhattan every day of the week. You won’t have trouble tracking down these guys; their orange- and black-striped truck is hard to miss. Must try: The Porkinator Burrito, filled with pulled pork, fried rice, slaw, BBQ sauce and cheese. If it’s possible, each bite is at once more savory, spicy and sweet than the one before it. A hole-in-the-wall joint with just a dozen seats, this Upper West Side seafood haven features the freshest picks of the sea. 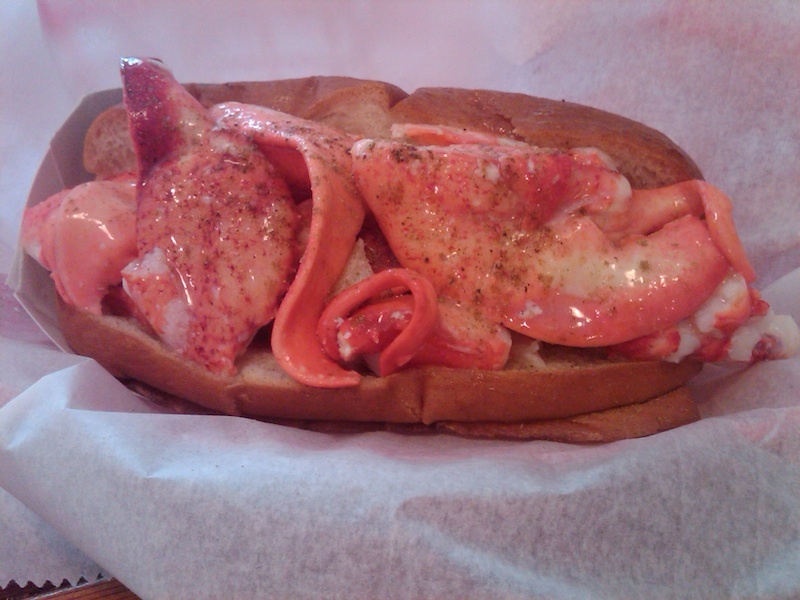 At $16 a sandwich, the lobster rolls are a bit of a splurge, but they are so beyond worth it. Picture this: a thick yet light piece of Texas toast that is soaked with butter, toasted to a light golden brown finish and filled to the brim with the most tender, meaty pieces of lobster that are warmed just by the heat of the bread, dressed with a scant amount of mayo and sprinkled with a dash of oregano. There’s no way to eat this gracefully, so just go for it. Must try: Schooner Combo – One lobster roll, a bag of Miss Vickie’s chips, a pickle and a Maine Root soda. I could (and should!) write a novel about Shake Shack. It is just that good. Let’s start with the burgers: Never overcooked, always with a rosy blush center, these tender beef patties are best when left to their simple, natural deliciousness. I opt for just cheese, pickles and extra ketchup on my burger, though their signature ShackSauce, available on the Shack Stack, is a creamy, tangy blend of top-secret spices and should not be missed. The fries: crinkle-cut. Normally I forgo potato-focused French fries (and opt for their grease-laden counterparts), of which the crinkle cut is an example, but when ordered well-done, Shake Shack fries are pure crispy, salty heaven. Once again, extra ketchup, please. And last but most certainly not least, the Concretes: Shake Shack’s version of a super thick frozen yogurt blended with a variety of additions. Not one to pass up chocolate anything, I opt for the Shack Attack, made with chocolate custard, cookie dough, hot fudge, chocolate chunks and chocolate sprinkles. Must try: If you’re in New York City for only a short time with no definite plans to return, I say order all of the above. Go big, then go home. However, if you’re a New Yorker, I’d start with just a Shack Stack burger and fries. Enjoy the most traditional of Shack tastes then delve into the rest of their menu. Sometimes you just need a plate of meat and potatoes, and for that, I go to Good Enough to Eat. With a menu featuring everything from soups and salads to burgers, sandwiches, pork and pasta, there is something for just about everyone at this restaurant. Cloth dishrags serving as oversized napkins, rustic wood and brick walls and countless cow decorations all add to the homey atmosphere of this casual local spot. Must try: Traditional Turkey Dinner, featuring roast turkey, mashed potatoes, stuffing, cranberry sauce and kale, served with a side salad. A typical New York City diner with atypically stellar diner food, Deluxe is a charming restaurant nestled along the residential streets of upper Broadway. This is no Seinfeld-esque diner with white-washed walls and zero personality; Deluxe is covered floor to ceiling with Columbia fan gear, historic images and neighborhood pictures alike, and the servers are personable and humorous, adding to the conviviality of this relaxed and comfortable dive. Must try: Deluxe Grilled Cheese Sandwich. Order the optional bacon as a savory, perfectly greasy addition; you won’t regret it. Choosing the best pizza in New York is practically the equivalent of choosing a favorite child in a family of 10; it’s nearly impossible, but it can be done. When I eat pizza, I am looking for two things: a crispy crust and real tomato sauce. Patsy’s does both exceptionally well. Their crust is just thin enough to elicit an audible crunch when I bite into it, but it’s not so thin that my sauce – featuring whole tomatoes – seeps through. I most often visit the Patsy’s Pizzeria on West 74th Street, and there is always a welcomed mix of young locals, after-work businessmen with their families and mommy-and-me groups filling the house. Serving fresh salads, hearty pastas and golden brown calzones in addition to pizza, Patsy’s is a neighborhood favorite that is usually waiting-out-the-door busy. Must try: Pizza With Prosciutto. The extra salty bite of the prosciutto perfectly balances the sweetness of the rustic tomato sauce. Maria Russo is a Barnard College senior and considers herself a proud New Yorker after living here for just four years. Great post. I’m about to visit NYC and was looking for the good local recommendations instead of ‘the same old same old’ tourist traps!